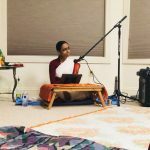 By the immense grace of Sri Swamiji, Poornimaji’s satsangs in Atlanta was very well received by everyone. This was Poornimaji’s first trip to Atlanta. 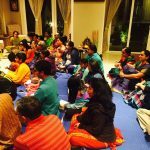 GOD Atlanta chapter organized a satsang at the residence of Sri.Raviji and Smt.Hemaji on Friday, April 27 2012. The satsang commenced with Narayaneeyam parayanam by Smt.Shobaji followed by kirtans of Sri Sri Swamiji for half hour. 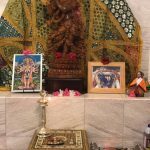 Following this Sri Poornimaji spoke about the essence of Bhagavatha Dharma and stressed on the importance of divine association with Mahatmas. 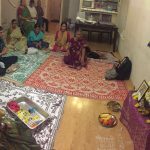 The audience were spellbound and listened to Sri Poornimaji with awe and reverence. 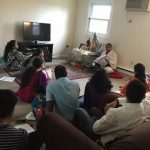 The whole house was packed with devotees and about seventy people attended the satsang. 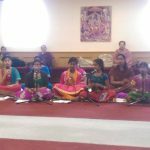 Many of the them who attended this satsang also attended the two day satsang event at Sri Hanuman mandir on April 28th and 29th 2012.